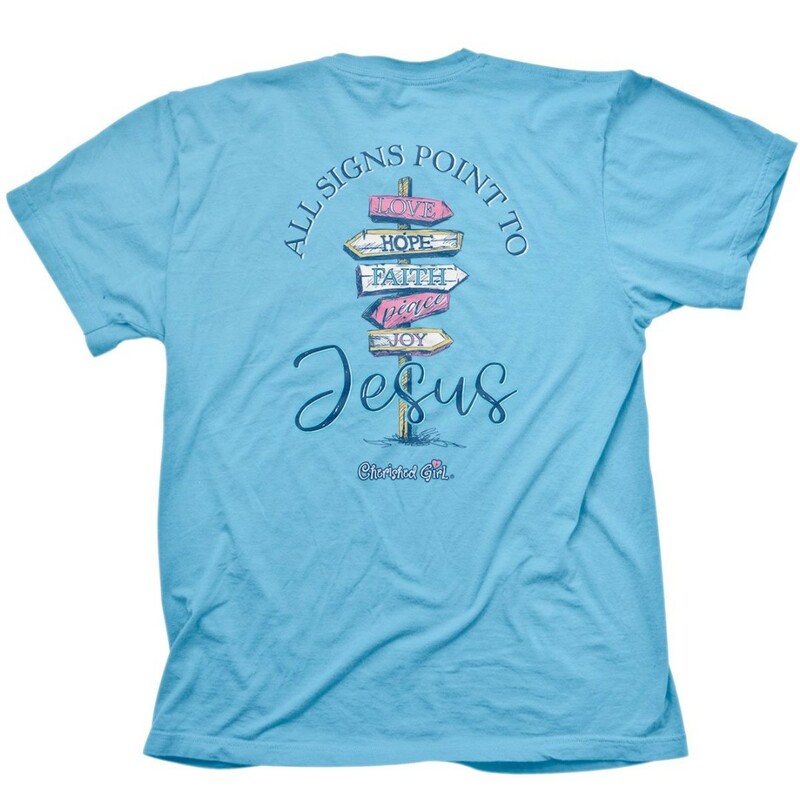 Take a guided journey of faith in this “All Signs” T-Shirt in Sky Blue by Cherished Girl®. All signs point to Jesus! Love, hope, faith, peace, and joy are yours to treasure when you follow the path Jesus has laid out for you. Nothing else offers the assurance you’ll find in faith, and there is no other god before our Creator. Psalm 32:8 says, “The LORD says, ‘I will guide you along the best pathway for your life. I will advise you and watch over you.’” You’re not a lost wanderer, you are a daughter of the King of Kings, with God’s Word (the Bible) as your roadmap, and the guidance of the Lord to lead you on the journey. You can travel the road of life with confidence, knowing God is guiding you on the best pathway. So many souls you meet along the way are lost and hurting. Show others the way when you wear this thoughtful T-shirt. It’s a ready opportunity to share the hope you’ve found in God, and an introduction to faith. Cherished Girl All Signs T-Shirt 2XLarge was published by Kerusso in May 2018 and is our 8624th best seller. The ISBN for Cherished Girl All Signs T-Shirt 2XLarge is 612978454183. Be the first to review Cherished Girl All Signs T-Shirt 2XLarge! Got a question? No problem! Just click here to ask us about Cherished Girl All Signs T-Shirt 2XLarge.